Would a tiny computer that ships with a remote control barely bigger than a credit card and comes in a champagne gold finish tempt you? How about one that can even improve your internet connectivity and become a wireless access point? 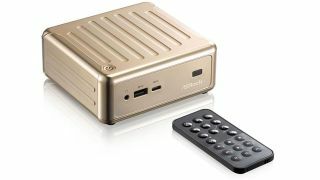 Taiwanese company ASRock believes that its small form factor PC, the Beebox, will "smoke" the rest of the competition including Intel's own NUC reference designs. The company will use a dual-channel configuration rather than a single channel one, allowing for up to 16GB of memory to be squeezed into the PC. It didn't confirm what processor would plug in the Beebox but did say that it would be a Braswell model, the 14nm successor to Bay Trail with the Pentium N3700 being the top of the range member. The rest of the device's specification doesn't appear to be too shabby either. It has two HDMI ports and DisplayPort, allowing for up to three monitors to be connected. There's also a Type-C USB port – which could potentially accommodate another monitor – two USB 3.0 ports, a GbE port and 802.11ac Wi-Fi. The Beebox will land in July and Asrock has yet to confirm how much it will cost.